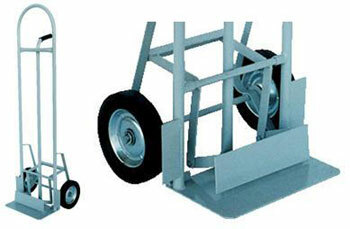 High Back Aluminum Hand Truck with Push Out will transport tall heavy loads weighing up to 300 lbs. from workstation to workstation. When the load has reached its final destination, the user simply pushes down on the back plate with their foot and the plate on the front of the unit will slide the load off. This feature reduces stress on the users back. 8" x 1¾" semi-pneumatic wheels. Ships knockdown. Specs: overall size 18"W x 17"D x 55"H; nose plate 13 1/2"W x 7 1/4"D; capacity 300 lbs.